Hardwood floors are beautiful, but they can require more to maintain than other types of flooring, which is why many homeowners opt for other types of flooring in their homes. With the right mop, hardwood floors can be easier to clean and maintain, but what is the best mop for hardwood floors? 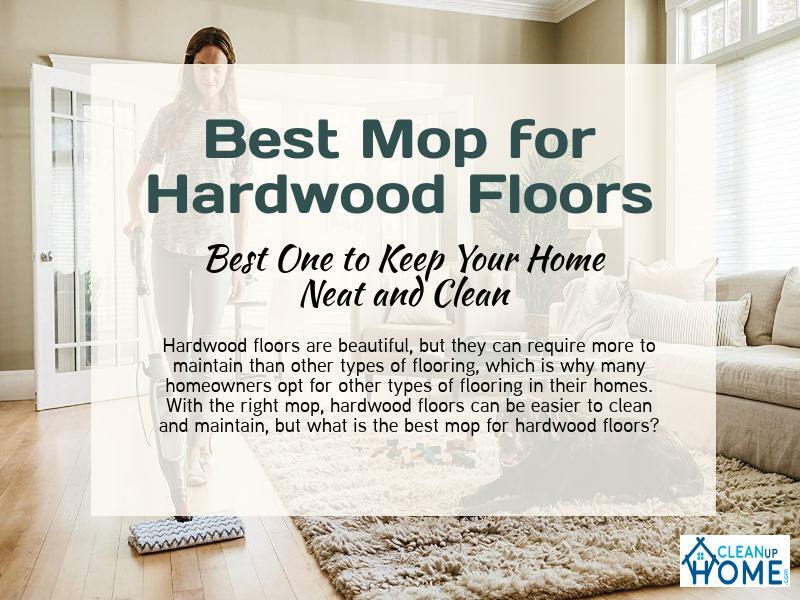 Before we take a look at the top five options, let’s take a look at the different types of mops and how to clean hardwood and tile floors. When you start your search for the right mop for your hardwood floors, you are going to need to be aware of the different types of mops that are available on the market and how well they will work on your hardwood floors. String Mops – These are the traditional cotton mops that you have probably seen since you were a child. They are great for getting into tight corners, and they are inexpensive to purchase. Most of these mops will require you to wring them out with your hands, but they work well on most floor types. Sponge Mops – Sponge mops are great for scrubbing because the head of the mop is literally a sponge, so it will be quite effective at getting up those tough spots. They are ideal for cleaning tile, hardwood, and other uneven surfaces. Spin Mops – A spin mop is an excellent upgrade from a traditional string mop. You do not have to wring the mop out by hand, but it will clean the floor quite well. Some of these mops will even spin as you clean, which makes them more effective. Steam Mops – With this type of mop, you will need to fill the mop itself with water instead of using a bucket. The water is then heated to create steam, which will clean and disinfect your floors with ease. 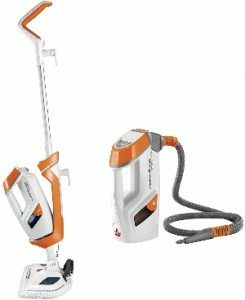 Like the previous product, this Bissell PowerFresh unit has a detachable handheld unit, but this product differentiates from the last because the handheld steamer includes a hose attachment. This attachment makes cleaning up harder to reach areas a much easier proposition. In addition to this functionality, there are 13 tools that you can use with the handheld to ensure a deep and satisfactorily clean. The product is also great at removing odors thanks to the odor eliminating fragrance discs that are included. So this is one of the best product for the pet owner. For lighter jobs, you can use the included soft microfiber pads, but if the mess is tougher, you can opt to use the microfiber scrubby pads to get a deeper clean. This product has so many included tools that it’s one of the more versatile products in the guide. The detachable handheld unit is very maneuverable thanks to the hose attachment. This even includes a grout tool so that you can clean the bathroom with ease. The steam performance is very powerful so that you can achieve a robust clean on your hardwood. The cap on the water tank can break fairly easily. It doesn’t work on high gloss floors. This product, which is manufactured by Light ‘N’ Easy, is a steam mop with an 11.5-ounce tank, so you can expect a lot of steam production before you have to refill. Additionally, this also has decent range since the company ships it with a 20-foot cord. 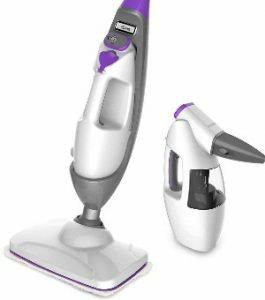 In addition to its ability to clean deep into hardwood surfaces using steam, there’s also a detachable handheld steamer that can help you steam clean things like curtains and even kitchen surfaces. Like the previous product, this unit has three cleaning modes, which ensures for an intelligent functionality that will allow you to tailor the clean to the job. The detachable handheld steamer adds a lot of versatility to the product. This product has a very large tank (11.5 ounces), so it’s great for large jobs. It has a sleep mode when it’s not in use. This steam mop is rather large, so some shorter users may have issues with its height. The instructions don’t do a great job of explaining how to use both functions. Another SharkNinja product, this steam mop has intelligent features that make it a good product for those looking to clean hardwood floors. You don’t always need the maximum steam output to spot clean. This is why the Shark Genius is so useful; you can reduce the amount of steam for the job using the three settings. At its highest setting, the steam virtually blasts out of the mob to remove stuck-on messes with ease. When it comes time to clean the dirty pad, there’s a touch-free tech that allows the pad to detach with ease. Once freed, you can simply transfer it to the laundry so that it can be cleaned for later. The handle is designed to be shaped like a ring, which makes control very easy. The maximum setting is very powerful. This steam mop has dual-sided pads. The pads can loosen over time. The cover for the water tank is very flimsy. Unfortunately, this isn’t a mop that will stand by itself. When you need to clean larger areas, it’s helpful to have a maneuverable mop that can really handle corners. This product, which is manufactured by SharkNinja Steam, is designed to be compact and maneuverable so that tight corners are easy. This steam-powered mop also is designed to use microfiber pads to really get into the cracks and crevices of your hardwood or tile floors, so it doesn’t lack cleaning power. To provide a strong steam cleaning performance, this mop is designed to hold a lot of water. In fact, this is a model featuring an “XL” water tank that has a capacity of 450 milliliters, which produces a lot of steam. The product has a 25-foot power cord. The handle is very ergonomic, and the large capacity means that you’ll be able to clean for an extended period. The two included microfiber cloths are completely washable. It has a large water tank. It has a hard time reaching dirt and debris that is embedded in the grout. Pumping the product to produce superheated steam can be hard for some users. The pads will shrink in the dryer. While many of the best mops for hardwood floors use steam, this Bissell product uses a spin action design instead. As a result, any dirt and debris that may be caked onto the wood’s surface are scrubbed away efficiently. The product has a 28-ounce tank that moistens the pads. The pads themselves come in two varieties: soft pads for more delicate surfaces and pads that have a rougher surface for those floors that need a deep cleaning. Another useful feature is the onboard sprayer, which you can use to fire solution onto the floor’s surface for a deeper clean. The handle is very ergonomic and easy to use. The spin pads really clean deeply, even when you’re using the softer ones. The mop pads are completely washable. This is a very lightweight mop, and it doesn’t produce much noise. This product, with its round scrubbers, has a hard time cleaning in corners. It doesn’t have wheels, so older individuals may have a tough time carrying it when off. The pads could definitely be a bit more absorbent – you may need a regular mop for bigger spills. Cleaning a hardwood floor is different than other floors because using a lot of water on the surface can cause damage to the wood. Your mop should only be damp when you use it, and you will want to use cleaning products that are meant for wood such as Orange Glo or Murphy’s Oil Soap. More detailed cleaning instructions written by Mary Ellen Pinkham an author of Today.com. She has been written a great guide on this topic. Steamers and spin mops are great options to consider because of they clean without leaving much water on the floor. Tile floors can be washed with a generous amount of water and cleaners that are designed to disinfect so that you can keep the grout between the tiles clean. Harsh chemicals are not required, and they should actually be avoided because they can cause damage to the tiles instead of cleaning them. Tile in your bathroom will need to be cleaned at least once a week, but other areas of your home can typically go for two weeks without being cleaned. Better Homes and Gardens has a more detailed cleaning guide that you can examine. The size of the mop so that you can spend less time mopping. The type of mop heads that you are purchasing and whether it’s going to collect germs and spread bacteria. The absorbency of the mop. The weight of the mop, and how easy it is to maneuver. The features and attachments that are included with the mop. So, when it comes to the best mop for hardwood floors, which of the products that we have reviewed come out on top? All of the mops above are great options that will work well on hardwood floors, but if we had to choose one, it would be the Bissell PowerFresh Lift-Off Pet Streamer. It has a swivel neck, it’s designed to eliminate 99.9 percent of odors and germs, and it comes with 13 versatile tools that you can use around your home. It is designed for pet owners to clean their floors, but it is an excellent option for any home with hardwood floors.